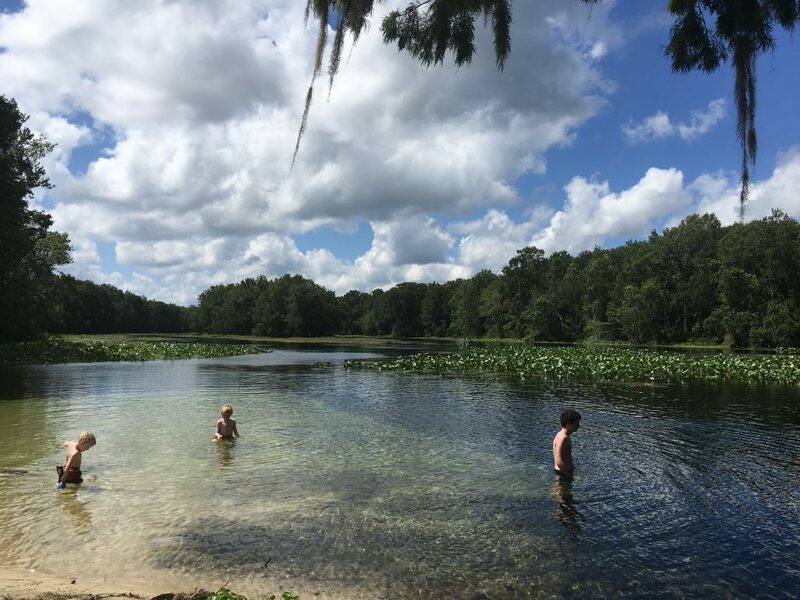 Florida’s park system has many unique and quality experiences to offer visitors, but few stand out as much as The Edward Ball Wakulla Springs State Park. It is home of the world’s largest and deepest freshwater springs. The brisk water is home to manatees, alligators and a host of diverse wildlife which can be viewed from the shore or a boat. Each season delivers a different selection of birds passing through and offering birdwatchers a prime destination to see the avian residents and visitors in a natural setting. The bracing, some say chilly, 70 degree waters are sure to refresh bathers even during the hottest summer days. For some human visitors ankle deep is enough to experience. 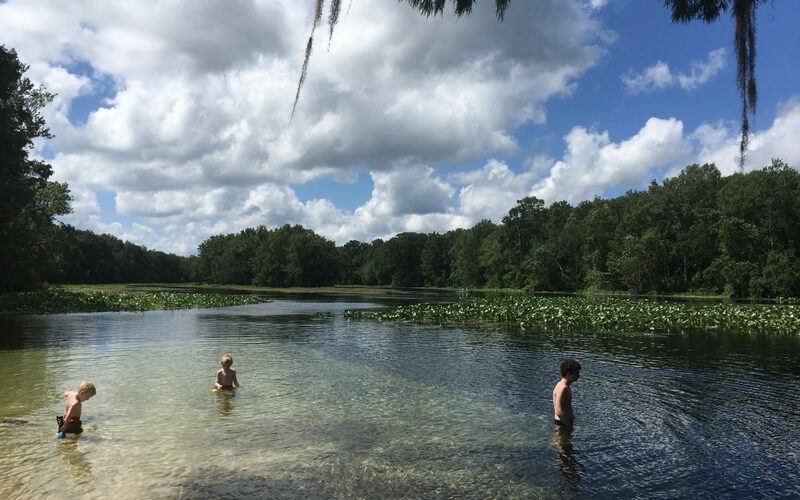 Wakulla Springs’ history extends back thousands of years with evidence of varied use by people and animals, some long gone. Early residents lived in shoreline villages and took advantage of the plentiful natural resources to support their idyllic existence. One novel use of the area was by filmmakers who appreciated the primeval quality of the park’s swamps and wildlife as a backdrop for cinematic productions. Hollywood films such as Tarzan’s Secret Treasure (1941) and Creature from the Black Lagoon (1954) were shot at this location. The historic lodge is an elegant remnant of old Florida, and set among the ancient cypress trees which surround the swamps. The Spanish style lodge with its period furniture, original elevators and colorful painted ceilings that depicts wildlife and Old Florida scenes still takes lodgers. Silent Night It Is Not!!! Cicadas Sing the Evening Away. Only a shell of its former self, the exoskeleton shed by a cicada is all that remains of the previous night’s long pursuits. Autumn evenings in the panhandle are usually beginning to reflect the official change of seasons with cooler air and a slight lessening of the raucous din created by insects and birds. The recent early-fall hurricanes have brought the area a wide breath of hot, humid air, delaying the long anticipated start of relief from the sultry summer environment. Anyone hearty enough to take an early evening walk in north Florida will experience a continuation of the frenetic activity and riotous sounds typical to summer in the south. 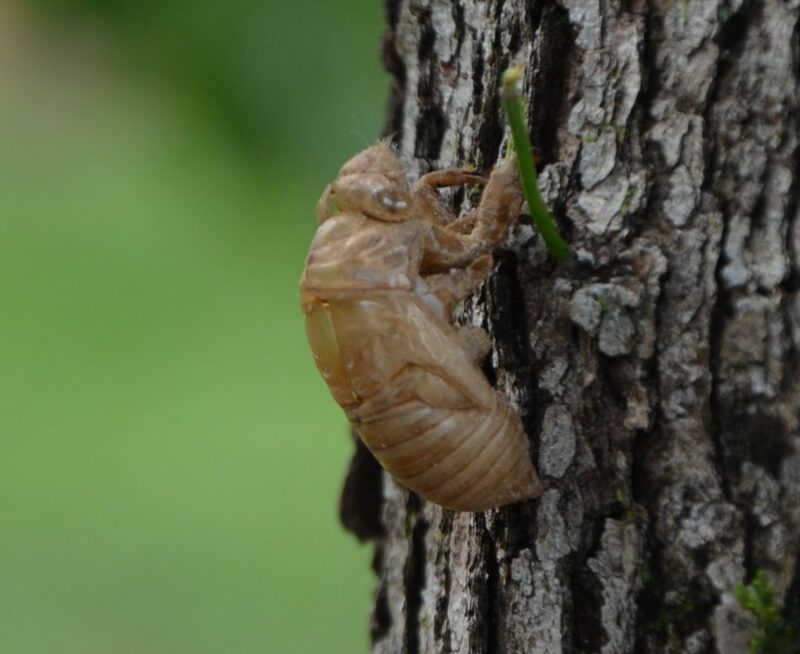 The near deafening call of cicadas (Magicicada spp.) is part of the cacophony. 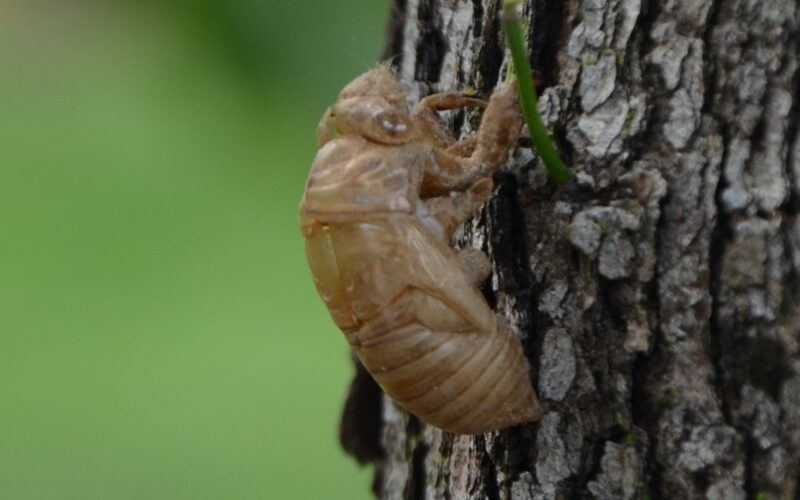 Once commonly identified as locust in the region, their near-mechanical buzzing originates from the protection of foliage in trees and bushes during the day or twilight hours. During the dark hours they sing often and relocate frequently. It is important to note cicadas are not the locust of infamy which shred the green, lush landscapes and foretells famine. While locust and cicadas are both insects, the similarities end there. These seldom seen or captured insects known for their boisterous, sometimes undulating, chorus do leave strategically placed souvenirs for the sharp-eyed observer. This discarded residue of their early life stages is a highly valued tool for many elementary school boys with a prank in mind. The hard shell is harmless, but under the right conditions does have a certain shock value appreciated by juvenile miscreants. Their nymph stage skeletons are often seen on the trunks of trees, shrubs stalks and even the siding of buildings. The opaque brown shells are abandoned when the cicada outgrows it and then emerges to form a new exterior. The process is similar in other insect species with an exoskeleton having very limited potential for growth and expansion. The rigid coating provides this creature an armored surface to fend off the challenges of being small and small in a big hungry world. In some states, cicadas are famous for their periodic appearance in colossal numbers, sometimes as many as 1.5 million per acre. These once every 13 to 17 year swarms do not occur in Florida which has an insect friendly environment. The 19 Florida cicada species fall into three groups based on overall size measured by the length of the forewings. They produce their songs with timbals, paired drum-like structures on the sides of the abdominal segments. A muscle attached to the timbal plate causes the timbal ribs to pop inward and project outward when relaxed. Flexed rapidly, the cicada chorus can deliver hours of uninterrupted night music. In Florida, only males have timbals and the females are mute. Most sounds made by males are calling songs which serve to attract the silent females. Cicada nymphs live in underground burrows where they feed on xylem sap from roots of grasses or woody plants. Because xylem sap is low in nutrients, complete nymph development takes several years to successfully mature. All cicada species molt four times underground. When the cicada nymph is ready for its fifth and final molt it makes its way to the soil’s surface. It climbs a short distance up a tree trunk or stem, anchors itself and molts for the last time becoming an adult. If male, the new cicada will add its contribution to the nightly festivities. If female, she will quietly wait for that special, one in a million, nocturnal crooner. To learn more about north Florida’s noisy night insects, contact the local UF/IFAS County Extension Office. Click here for contact information. It is easy to notice the display of bright pink puffs erupting on low-growing trees along roadsides. 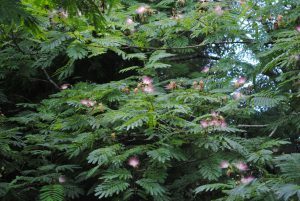 This attractive plant is the Mimosa tree, Albizia julibrissin. These once popular small trees are commonly found in the yards of older homes in Florida where the display of prolific blooms starts up as the weather warms. 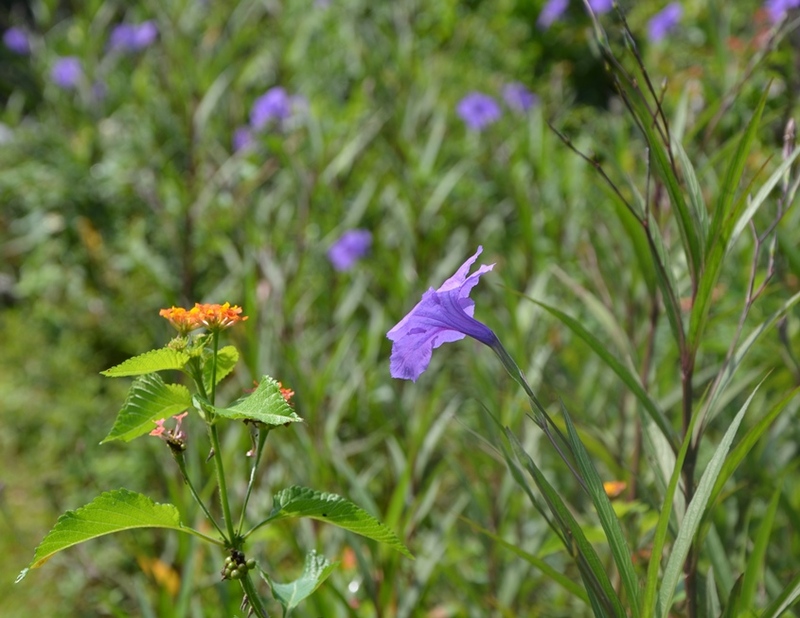 This species is also classified as invasive native to southwest and eastern China, not Florida. Many Florida residents may not realize this tantalizing beauty is actually an aggressive invader in disguise. 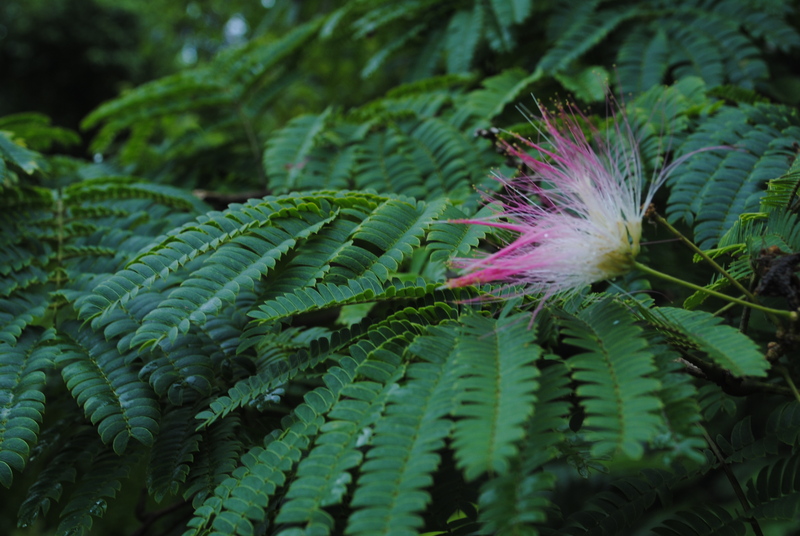 The beautiful mimosa is found throughout the Florida panhandle. It has spread from southern New York west to Missouri south to Texas. It is even considered an invasive species in Japan. Worse yet, mimosas are guilty of hosting a fungal disease, Fusarian, which will negatively affect many ornamental and garden plants. Some palms as well as a variety of vegetables will succumb to this pathogen. In natural areas the invader will disrupt not only other plants, but also the birds, mammals, amphibians, and insects which depend on the displaced plants for food, shelter and habitat. Other negative traits include the disruption of water flow and aiding the incidence of wildfires. In natural areas, mimosas tend to spread into dense clumps blocking the light to native plants which prevents them from growing. They are prominent along the edges of woods and wetland areas where seeds scatter easily and take advantage of sheltered, sunlit spots. Mimosa tree seeds can stay viable for many years in the soil. These seeds will float without damage to their germination potential until they wash ashore to colonize a new site. Additionally, Mimosa tree seeds are attractive to wildlife. One tree in a yard can infest many acres with the aid of birds and small mammals. Cut or wind snapped trees quickly regrow from the stump, making this one invader that is difficult to eradicate. Fortunately, there are a variety of small trees which can replace the Mimosa tree in home landscapes. Many are attractive, but without the unrelenting need to populate the entire subdivision. This is a beauty-and-the-beast combo tree with too many problems to compensate for its looks.